After the travel gestapo working for Homeland Security totally flubbed the warning they received about would-be terrorist Umar Abdullmutallab they have finally gotten off their fat asses and done something. Once again, it is the wrong thing. As you will remember they imposed these new absurd travel regulations stripping people of the right to pee during the last hour of a flight. Well, that information was made public through some blogs. So what do the Travel Nazis do? They go after the blogs with subpoenas. The writer Christopher Elliot, found a TSA agent at his front door with a subpoena saying: "You are hereby commanded by the administrator, Transportation Security Administration, United States Department of Homeland Security to produce and permit inspection of the records described below...."
While the TSA didn't have time to investigate someone reported by his own family as a terrorist, who flew without luggage and who appeared on a list of suspected terrorists, they do have time to harass bloggers. Why? The bloggers printed the new TSA "guidelines" on "How to Harass Innocent People Why Ignoring Real Threats." Okay, maybe the TSA called it SD 1544-09-06. They are demanding the bloggers reveal the source of their information. It is a pathetic commentary on the Homeland Security State of Napolitano and Obama, when instead of fixing what went wrong, they concentrate on unimportant issues while harassing bloggers. The TSA sent two of their thugs to visit travel blogger Steve Frischling as well. They confiscated his lap top computer. Frischling said that they threatened to "interfer" with his contract to write a blog for an airline if he refused to cooperate with them. They wanted him to name names. Is Joe McCarthey running TSA? The New York Times is reporting that the TSA refuses to say how many American bloggers are being harassed under this new fishing expedition. What they want is to silence anyone exposing TSA stupidity—which would be a full time job. So, all you morons who thought Obama would be different than Bush, you are right. He's worse. I could be wrong, but I don't remember TSA thugs harassing bloggers under Bush. That seems to be an Obama innovation. Certainly this contempt for the First Amendment is not unique it was used before—by men like Stalin, Mao, Mussolini and Hitler. The agents threatened to get Frischling -- a blogger for KLM airlines -- fired from his job, confiscate all his electronic devices -- phones, computers, and iPods -- and declare him a security risk -- which would get him on the No Fly list -- unless he cooperated. Frischling -- who has worked for Life, Time, Newsweek, New York Times, and was embedded with troops in Iraq -- didn't know what to do. He couldn't reach a lawyer. The civil subpoena threatened a fine and up to a year in jail for failure to comply. The TSA has been under fire lately for failure to stop the Christmas Bomber from boarding the NW flight. Frischling told the Huffington Post that he didn't know who sent him the memo and that it is not in any of his computers. The memo was hardly secret. It was sent to approximately 10,000 airlines, airports, and security firms around the world, including locations in Riyadh, Islamabad, and Lagos. So the TSA sends out a directive to thousands of places, which is seen by tens of thousands of people, and then starts harassing two people for knowing what is in the directive. This is par for the bungling, authoritarian perfomance of Napolitano. She really does want to be another Janet Reno. Now all she needs is to kill some women and children by buring down their "compound" and send in armed thugs to terrorize a small child. Janet Reno Lives. Be Afriad. Be Very Afraid. 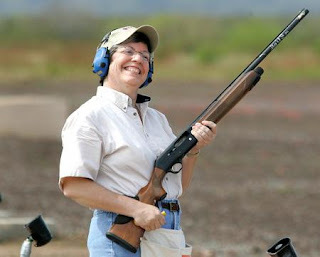 Image: Janet Reno showing the world some of her "tools of persuasion." She promised to later show reporters the "rack," "iron maiden" and other tools she finds usesful as first security reichfürher. posted by blog owner at 12/31/2009 05:09:00 AM DiggIt! Reddit Del.icio.us Slashdot It!